Dying battery? The sign everyone dreads. Running out of battery power? I could tell you to turn off your smartphone. I could tell you to stop checking your emails. I could tell you to not use Google Maps or any apps that use up power. This is not advice I would follow, so I won’t tell you that. I like using my iPhone to take photos, check the weather, and help me be LESS lost (aka ‘no sense of direction’). If you need to keep your phone charged during your stay in Paris, there are some easy ways to do so. But more importantly, where can you charge your phone in Paris for free? Yes, it’s awful to see that battery indicator show RED! Sometimes you just need a quick charge. I carry around an external battery. 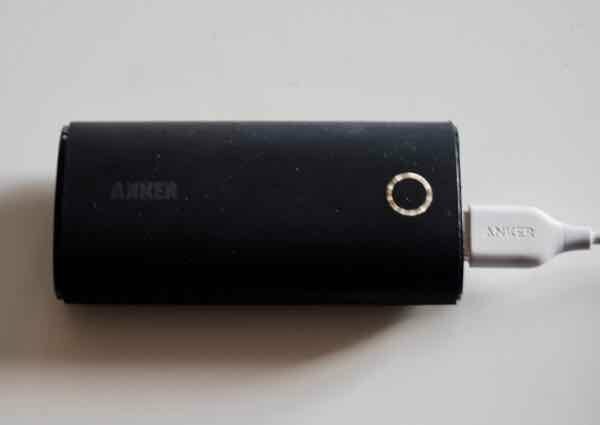 It’s by Anker and the brand always gets excellent reviews. It’s small, very easy to use and has enough power to charge two iPhones. I just plug my phone into the battery and in no time the battery is back to 100%. I can still continually use the phone even if it’s being charged. At most airports today, you will find USB and electrical outlets to enable you to get some additional charge. Fortunately, it isn’t as much as a fight to get that one outlet as terminals are providing kiosks and food counters where you can sit, eat, and get charged. 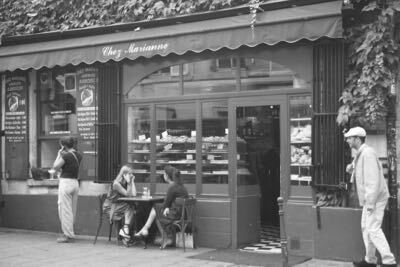 What is more difficult, however, is finding an outlet in a restaurant or store. I’ve tried finding an outlet near a table where I am having lunch or dinner and I’ve been shocked how hidden (or unavailable) they are. I’ve searched everywhere, but they all seemed to have been hidden. Guess they didn’t want patrons using their electricity. Fortunately, there are three alternative ways to charge your smartphone in Paris. This looks like an ordinary bus shelter but it is also a charging station. This added feature has been provided by the outdoor advertising company, JCDecaux for the last few years to over 2000 bus shelters in Paris. 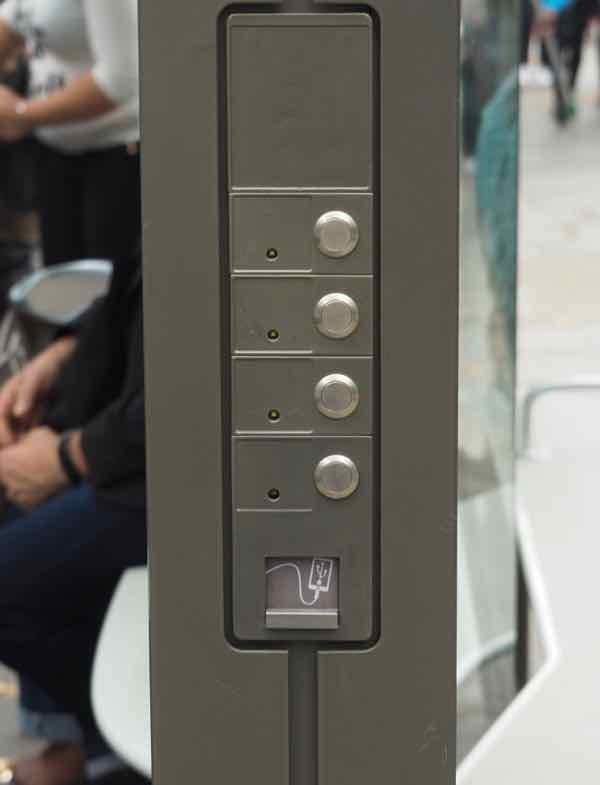 At the end is a USB port where you can plug in your smartphone for free. You’ll just need your power cord to plug it in. As for how secure it is for your data, I can’t comment. My only suggestion would be to power off your phone before plugging it in. At many rail stations there are places where you can charge your phone in Paris for free, but you’ll have to cycle to do it. 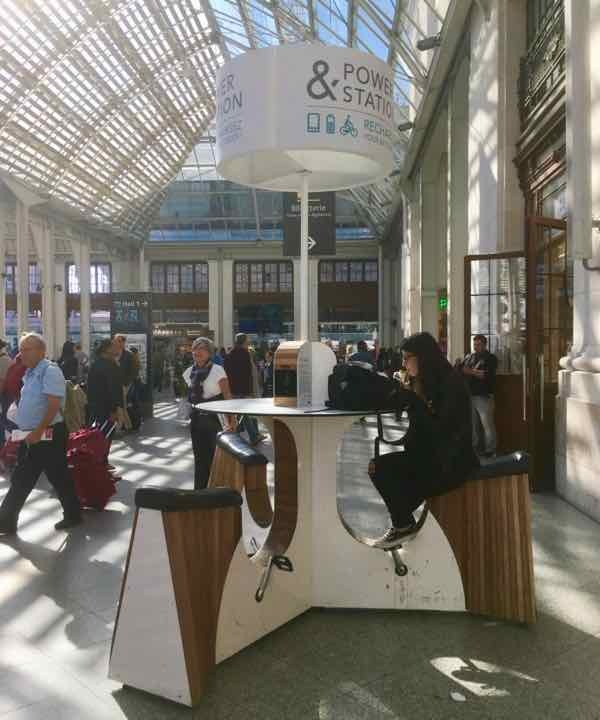 At Paris’ Gare de Lyon, there was a charging kiosk that has been constructed by WeWatt. 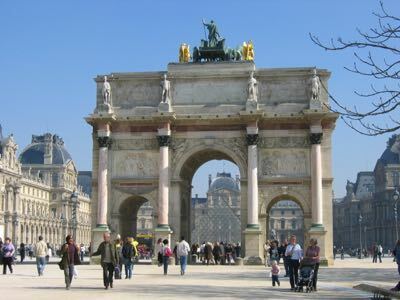 Their bikes are called “WeBike” and their kiosks are at airports, 6 Paris railway stations (including Gare Saint Lazare–pictured above—and Gare d’Aéroport CDG 2 TGV), and shopping malls throughout France and the world. Sure, you have to expend a little energy—-your peddling will get you the same amount of charge as if you plugged your smartphone into an electrical outlet (but peddling faster won’t help. It’s the time it’s plugged in that matters). If you get bored, you can always use the free on-bike Wifi. According to their website, 10 minutes of biking can give recharge about 15% of your battery. The company uses recycled materials and the kiosks are constructed by disabled people in Belgium. WeWatt, an initiative of former Flemish minister Patricia Ceysens and entrepreneur Katarina Verhaegen. 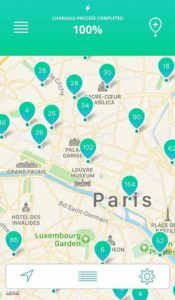 Powize app finds places to charge your phone in Paris. I recently discovered the Powize app. It allows you to find and share the location of charging stations with the Powize community. It uses geolocations to find the nearest public place, whether it be a cafe, restaurant, or store to charge your phone, tablet, or laptop. 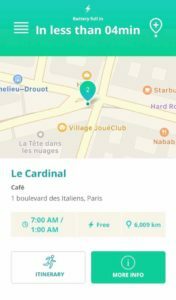 Released in early 2015, the app shows charging stations in over 580 points in France and over 20 countries around the world. It’s available in iTunes or Google Play. When I am in Paris again, I hope to try out this app and will report back. 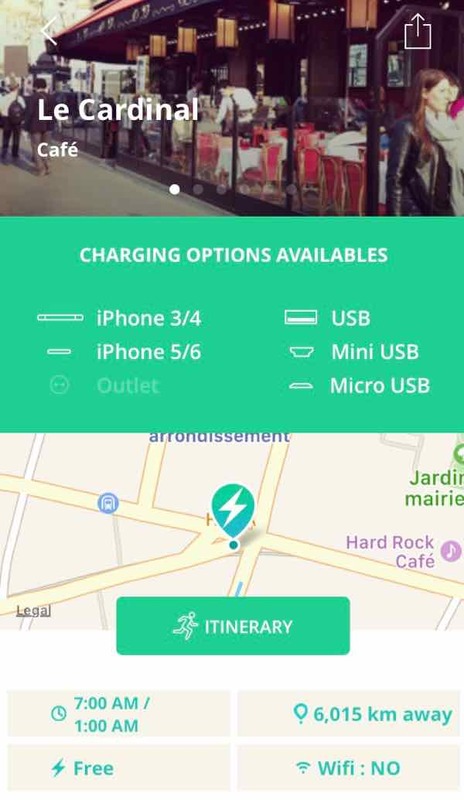 If you know of any other places where you can charge your phone in Paris for free, please share! This is a cute post. Usually when I travel I go to a coffee shop, but that can be annoying to have to sit there and wait for my phone to charge. If I am not doing that then I have a little battery pack, but it has a low battery life. Cool idea for a post. Thank you. I’m seeing more and more cities provide these kiosks which really help keep you charged at no cost. What a great and unique post. I love that you find these topics. Where, o where, is that statue of clocks? Thanks for your question. 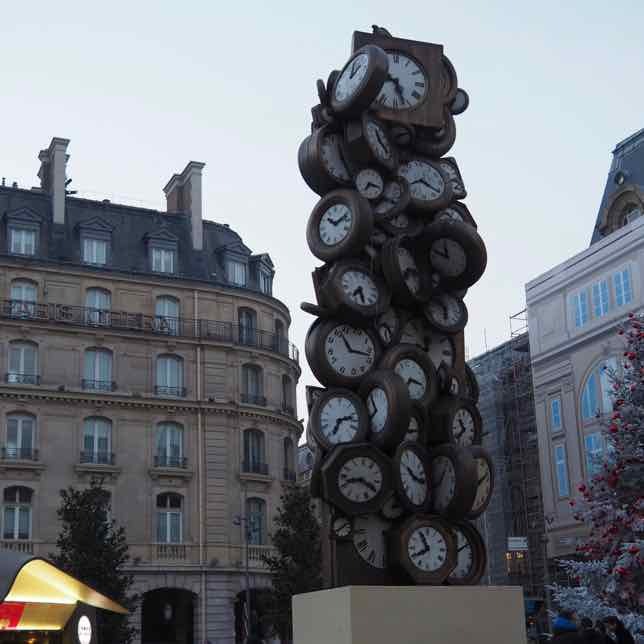 You can find that clock sculpture at Gare St. Lazare in Paris!